I’m no tattoo artist. I know that probably doesn’t surprise any of you, but I just thought I’d get it out there. The truth of the matter is that I wish I had the artistic ability necessary to tattoo for a living. But I don’t. Thankfully, there’s still one small way that people like me (that is, people who wish they could give life to wicked illustrations and drawings), can experience creating something that resembles a tattoo. 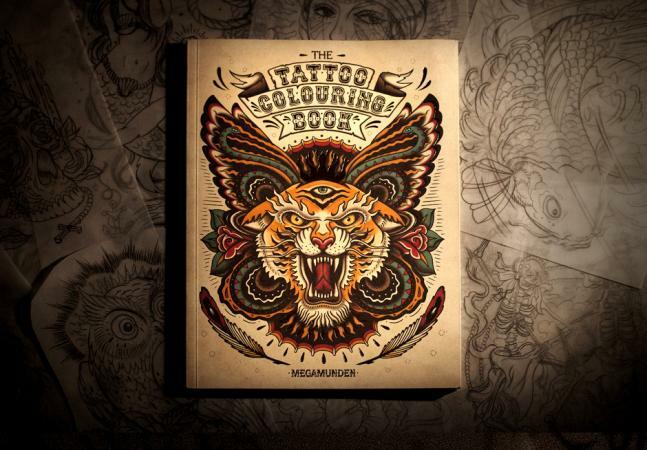 The Tattoo Colouring Book is filled to the hilt with images of tattoo flash that are just begging to be filled in with all the colour patterns that your brain can come up with. Okay, so maybe it’s not quite the same thing as inking a full blown back piece onto a ready and willing client who’s paying dearly for the privilege of your time and skills. But it’s still pretty cool to ink in the armour on an image of a Japanese samurai, before eventually sitting back and admiring your handiwork. We can’t all be Chris Garver, but this book at least allows us to pretend that we are without hurting anyone. ‘The show marks the opening of our new building whilst acting as the perfect follow up to the worldwide success of MEGAMUNDEN’s ‘The Tattoo Colouring Book’ – the Brighton based illustrator’s first book, published in 2013 by Laurence King Publishing. Looking to American and Japanese influenced tattoo styles ‘THE MEGAMUNDEN SHOW’ further progresses MEGAMUNDEN’s signature style, developed during his time creating the book and aims to be a body of work that isn’t only original illustrations and prints on walls, but to seamlessly integrate his detailed illustration style onto sculpture, leather products, fabric and even musical instruments…. So there you have it, some decent options for those of us who can’t tattoo but appreciate the art form – who says tattooists have all the fun?